Haganah (Hebrew: הַהֲגָנָה‎, lit. The Defence) was a Jewish paramilitary organization in the British Mandate of Palestine (1921–48), which became the core of the Israel Defense Forces (IDF). The Jewish paramilitary organisations in the New Yishuv (the Zionist enterprise in Palestine) started with the Second Aliyah (1904 to 1914). The first such organization was Bar-Giora, founded in September 1907. It consisted of a small group of Jewish immigrants who guarded settlements for an annual fee. At no time did Bar-Giora have more than 100 members. 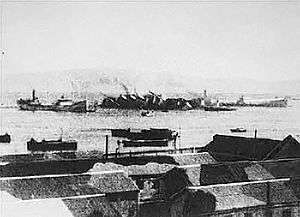 It was converted to Hashomer (Hebrew: השומר‎‎; "The Watchman") in April 1909, which operated until the British Mandate of Palestine came into being in 1920. Hashomer was an elitist organization with narrow scope, and was mainly created to protect against criminal gangs seeking to steal property. During World War I, the forerunners of the Haganah/IDF were the Zion Mule Corps and the Jewish Legion, both of which were part of the British Army. After the Arab riots against Jews in April 1920, the Yishuv's leadership saw the need to create a nationwide underground defense organization, and the Haganah was founded in June of the same year. 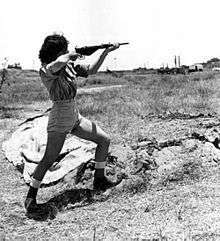 The Haganah became a full-scale defense force after the 1936–1939 Arab revolt in Palestine with an organized structure, consisting of three main units—the Field Corps, Guard Corps, and the Palmach strike force. During World War II the successor to the Jewish Legion of World War I was the Jewish Brigade, which was joined by many Haganah fighters. During the 1947-48 civil war between the Arab and Jewish communities in what was still Mandatory Palestine, a reorganised Haganah managed to defend or wrestle most of the territory it was ordered to hold or capture. At the beginning of the ensuing 1948-49 full-scale conventional war against regular Arab armies, the Haganah was reorganised to become the core of the new Israel Defense Forces. After the 1920 Arab riots and 1921 Jaffa riots, the Jewish leadership in Palestine believed that the British, to whom the League of Nations had given a mandate over Palestine in 1920, had no desire to confront local Arab gangs that frequently attacked Palestinian Jews. Believing that they could not rely on the British administration for protection from these gangs, the Jewish leadership created the Haganah to protect Jewish farms and kibbutzim. 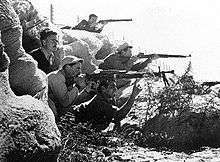 In addition to guarding Jewish communities, the role of the Haganah was to warn the residents of and repel attacks by Palestinian Arabs. In the period between 1920–1929, the Haganah lacked a strong central authority or coordination. Haganah "units" were very localized and poorly armed: they consisted mainly of Jewish farmers who took turns guarding their farms or their kibbutzim. By 1939, the British had issued the White Paper, which severely restricted Jewish immigration to Palestine, deeply angering the Zionist leadership. David Ben-Gurion, then chairman of the Jewish Agency, set the policy for the Zionist relationship with the British: We shall fight the war against Hitler as if there were no White Paper, and we shall fight the White Paper as if there were no war. In 1944, after the assassination of Lord Moyne (the British Minister of State for the Middle East), by members of the Lehi, the Haganah worked with the British to kidnap, interrogate, and in some cases, deport Irgun members. This action was called The Saison, or hunting season, and was directed against the Irgun and not the Lehi. Future Jerusalem mayor Teddy Kollek was later revealed to be a Jewish Agency liaison officer working with the British authorities who had passed on information that led to the arrest of many Irgun activists. 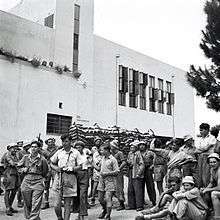 The 7th Brigade, in Hebrew "Hativat Sheva" - formed in 1948, manned mainly with Holocaust survivors and including a number of Machal troops. Almost annihilated at Latrun, then re-formed in the north. It had tanks and mounted infantry. The 8th Brigade - founded on May 24, 1948 and subordinated to Yitzhak Sadeh as the IDF's first armoured brigade,	headquartered near Jerusalem. The 9th or Oded Brigade - headquartered in Jerusalem. ↑ Johnson, Paul (May 1998). "The Miracle". Commentary. 105: 21–28. ↑ Speedy (2011-09-12). "The Speedy Media: IDF's History". Thespeedymedia.blogspot.com. Retrieved 2014-08-03. ↑ "The Role of Jewish Defense Organizations in Palestine (1903-1948)". Jewish Virtual Library. ↑ Freund, Gabriel; Sahar, Raz (30 May 2013). "Defending the nation for 65 years". IDF Spokesperson. ↑ Niewyk, Donald L. (2000). The Columbia Guide to the Holocaust. Columbia University Press. p. 247. ISBN 0231112009. ↑ Yigal Allon, Sword of Zion. ISBN 978-0-297-00133-1. pp. 116, 117. ↑ Allon, pp. 125, 126. ↑ Andrew, Christopher (2009) The Defence of the Realm. The Authorized History of MI5. Allen Lane. ISBN 978-0-7139-9885-6. pp. 355, 356. ↑ Horne. p. 288, 289. ↑ The birth of Israel: Long, long road, economist.com. ↑ Joseph, pp. 23, 38. Gives the date of the call-up as 5 December. ↑ Levin, pp. 32, 117. Pay £P2 per month. c.f. would buy 2 lbs. of meat in Jerusalem, April 1948. p. 91.